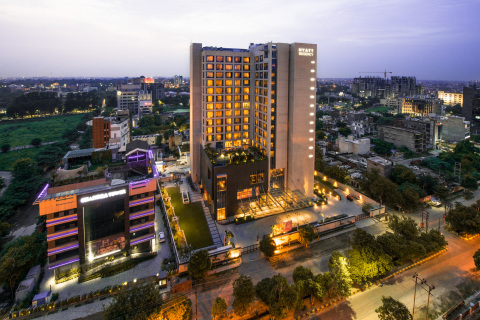 CHICAGO--(BUSINESS WIRE)-- Hyatt Hotels Corporation (NYSE: H) announced today the opening of Hyatt Regency Lucknow, the first Hyatt-branded hotel in Lucknow, capital of the northern state of Uttar Pradesh in India. Hyatt Regency Lucknow is the 27th Hyatt-branded hotel in India and further expands the company’s brand presence in South Asia by offering enriching, authentic and diversified brand experiences for guests. The dining options at Hyatt Regency Lucknow focus on offering different local and international dishes. The all-day-dining restaurant Rocca offers Italian and Awadhi cuisine ideal for a family, a group of friends or work colleagues. The restaurant features a live kitchen and pizza oven and offers a variety of Italian and popular Indian vegetarian and non-vegetarian dishes.